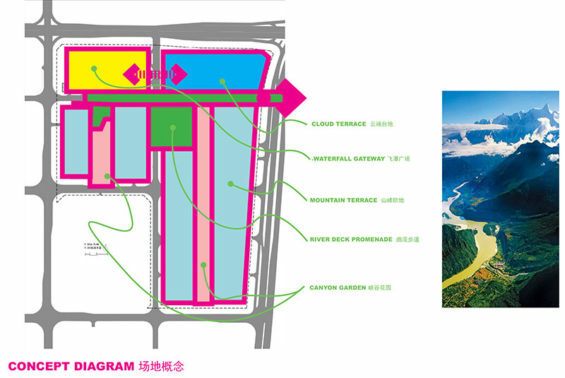 CRJA-IBI Group in collaboration with BLY Landscape Architects were selected to design the exterior landscaped area, roadways, elevated decks, gardens and roof gardens for four districts within the new Shenzhen Bay Technology and Ecology Park. Shenzhen is a major city in the south of Southern China’s Guangdong Province, situated immediately north of Hong Kong. The area is China’s first—and one of the most successful—Special Economic Zones. 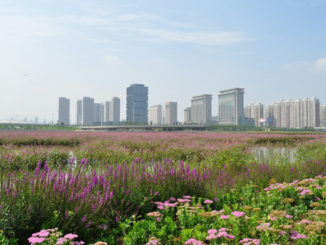 The project’s location within the urban fabric of Shenzhen offered the landscape architects distinct opportunities to create an energizing addition to the neighborhood. The ecology of the site is important to the overall surroundings. A defining feature of the surrounding landscape is water. Directly to the east is a river that traverses approximately 7km to a series of reservoirs to the north. The channel empties into the bay approximately 1.5km to the south. The water bodies serve as critical habitat to many different species of birds, reptiles, mammals and insects as well as providing essential drinking water to millions of people. Cleansing, conserving and reusing water throughout the site is paramount to creating an ecologically sustainable development. Shenzhen is situated in the subtropical part of China, located at about the Tropic of Cancer, and has a warm, monsoon-influenced, humid climate. Abundant rain offers unique opportunities for collecting and harvesting rainwater and reusing within the buildings and landscape. 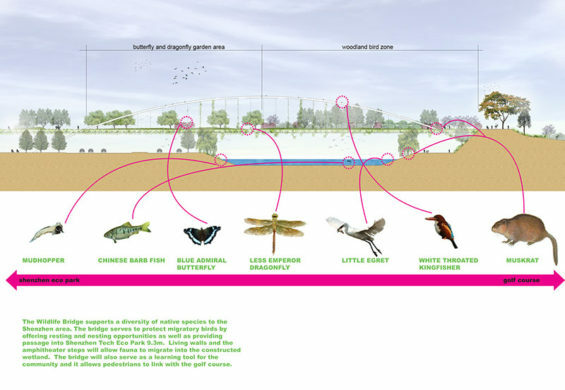 The architectural framework was already established by the client, and it was our goal from a landscape point of view to introduce the idea of establishing constructed natural systems in this highly urban infrastructure to filter and store water and provide urban habitat. The project spans multiple building levels and the landscape design was approached with the idea of weaving together a unified landscape experience with a series of dramatic moments to encourage pedestrians to move through the space. 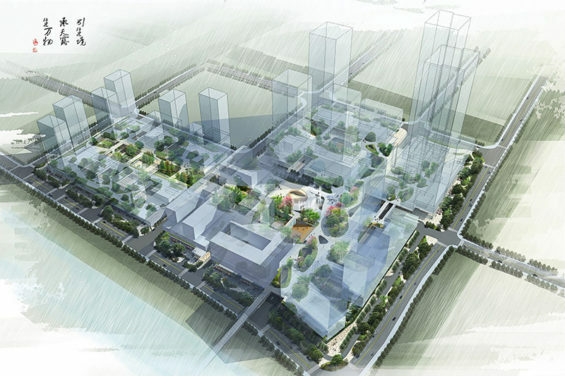 The overall design objectives of this project are to create civic spaces that are meaningful, memorable, and timeless. These unique sensory environments are informed by the physically distinct typologies that water creates throughout its life cycle on the landscape. This area of the project serves as the ‘Front Door’ of the development. A grand staircase with a cascading waterfall and shade loving plantings creates garden threshold. The space is meant to be a destination and not just an arrival zone. A progression of three bold moves unites the street level to the 9.3m level. 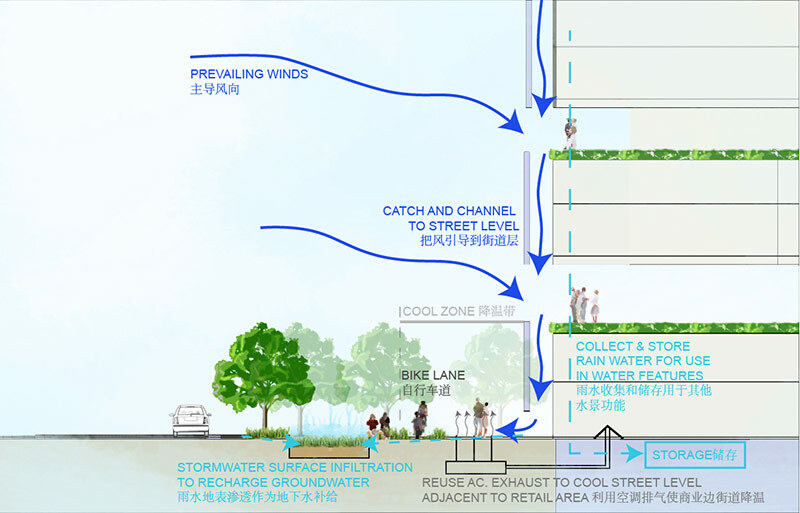 Located 9.3m above the street, this area features interactive misting to provide passive cooling as well as an iconic ethereal feature beckoning visitors from the street below. Dining and entertainment zones are located in this area to activate the terrace at multiple times throughout the day and into the evening. 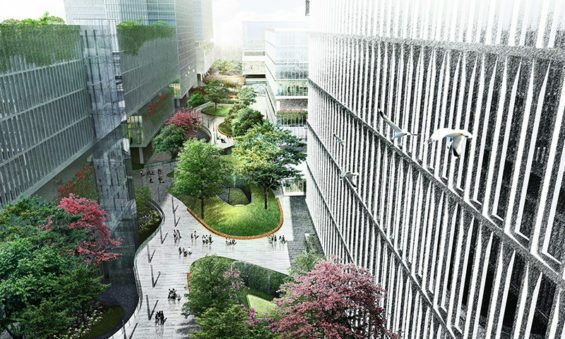 These areas are organized around green ‘pods’ which are shade loving planting zones under the building. Daylighting for the plants are provided through the use of fiber optic cables that receive sunlight from the roof and building facade through solar receivers. This feature serves to create subtle artistic expressions in the reflected ceiling panels. 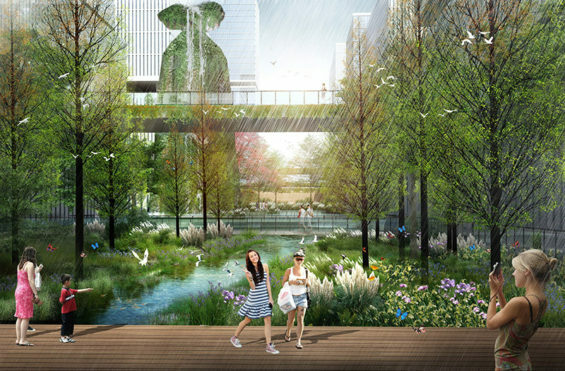 The Cloud Terrace affords views of the adjacent river to the east and will provide a cooler climate in the warmer months. This area provides users with areas for quiet reflection balanced with active recreation. The eastern side of the project offers views to the river. This area will have lounge seating at the edges so that users can soak up the morning sun or have a quiet afternoon nap. 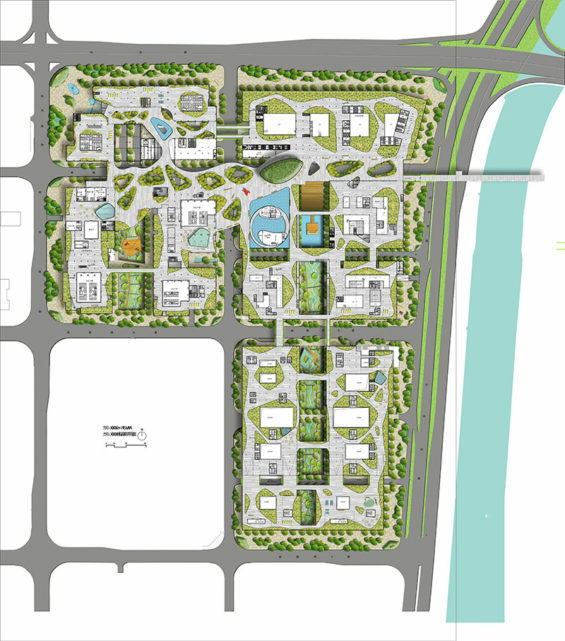 In the residential portion of the Mountain Terrace, residents will have access to adult fitness areas, children play zones, open space for morning tai chi or evening dance. Also provided are areas for table games such as Mahjong, chess or cards. This serves as the primary circulation system for the 9.3 level. It serves multiple functions in order to unite the various districts. 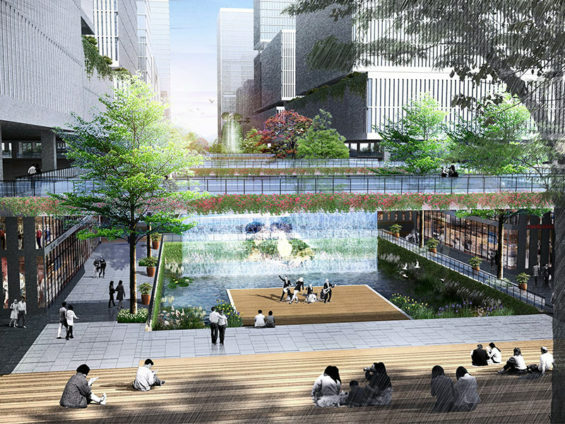 The River Deck Promenade is divided into four distinct spaces united by common materials. River Walk – Main East-West circulation pattern. Bold Plantings with light well openings to the level below. Performance Amphitheater – This serves 2 functions, one to create a dynamic performance space and two to unite the 9.3, 0.00 and basement levels. 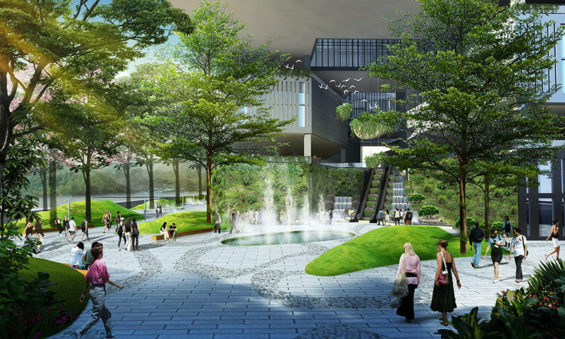 Water Plaza – This main civic space shall be activated by a cafe with the feature building serving as a dramatic backdrop. This garden is meant to provide a revelatory experience for the user. The Canyon Garden is a working constructed wetland that serves as the heart and lungs of the project by cleaning and restoring greywater and rainwater to its pure form. From the South the gardens gradually step down from the street level elevation to the basement level. Each step is a part of a natural process to filter water. The aesthetic goal is to create a beautiful manmade system that mimics nature. 4 unique features, that are multifunctional, work to integrate the garden at all levels. Performance Amphitheater – Located to the north, this serves as a grand stair to the levels below as well as space for music or performance art. 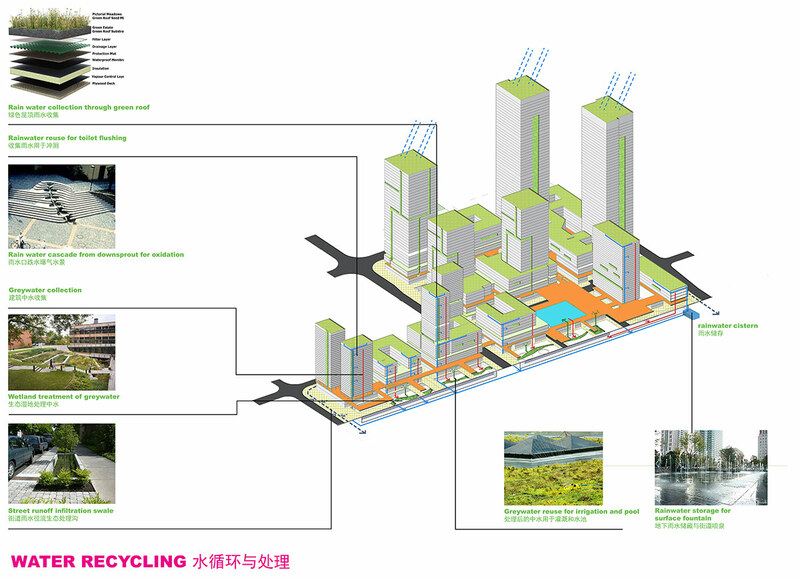 Living Tower – Centrally located this structure is clad in vertical plantings. Users can access from all levels and it serves as an interactive learning tool for the constructed wetland. Source Point – This serves a dual purpose, one to provide a forest like sense of entry for users and at the same time needs to allow for firetruck access.